This is perfect for a quick snack that you can whip up when friends pop round at short notice. Most of the sauce ingredients are likely to be in your fridge or store cupboard. For the sauce, mix the peanut butter in a small bowl with 2 tablespoons cold water. Stir in the soy sauce, honey and grated ginger, then add a squeeze of lime juice. Stir the yogurt and chopped coriander into the sauce, reserving a few leaves for a garnish. Cut the roast chicken into long strips. Deseed the cucumber and cut into batons. 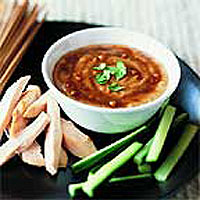 Serve with the satay sauce with cocktail sticks for easy dipping. To make this a vegetarian recipe, omit the chicken and serve the sauce with carrot and celery batons as well as cucumber. This recipe was first published in January 2004.